Carlotta Parisi with registered office in Via Spagni 57, 53024, Montalcino (SI) is the independent holder of the processing of personal data of users who browse the site, including navigation data, and those related to support activities pre and post sales. The Data Protection Officer is Carlotta Parisi, located inVia Spagni 57, 53024, Montalcino (SI). The data concerning users will be processed by Carlotta Parisi's collaborators as data processors who operate under the direct authority of the data controller, identified in the person of Carlotta Parisi. Users/visitors to the site can always contact the person responsible for the protection of personal data and exercise their rights (including the request for the complete list of appointed managers), by writing to the following e-mail address info@carlottaparisi.it or by sending a request to Carlotta Parisi (to the attention of the person responsible for the protection of personal data). 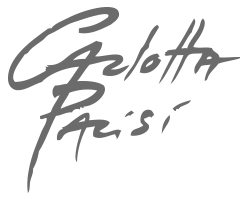 - personal data provided voluntarily by the user (such as, for example, the e-mail address, personal data, password for access to the reserved section "Friends"), or otherwise lawfully acquired on the occasion of the site with the user, to find the user's requests and offer the services, assistance and information required about the products and the world of Carlotta Parisi. The e-mail address provided voluntarily by the user will be used to proceed, as per his request, to the service of sending the periodic newsletter through e-mail, which will provide information on initiatives and activities of Carlotta Parisi. The internal procedures provide that the data provided are kept in paper and computerized archives and managed in the manner strictly functional for sending the newsletter. Personal data are not subject to communication, dissemination or transfer abroad. The user is always entitled to obtain from Carlotta Parisi confirmation of the existence or not of personal data concerning him, even if not yet registered, and their communication in intelligible form. You also have the right to obtain information about the origin of personal data; the purpose and the method of treatment; the logic applied in case of treatment carried out with the aid of electronic instruments; the identification details of the data controller and data processors; the indication of the subjects or categories of subjects to whom the personal data may be communicated or who may become aware of them in the quality, for example, of data processors or subjects authorized to process them. The user also has the right to request the updating, correction or, when interested, integration of personal data, cancellation, transformation into anonymous form or blocking of personal data, processed in violation of the law, including those that do not need to be kept for the purposes for which the data were collected or subsequently processed; the attestation that the above operations have been brought to the attention, also with regard to their content, of those to whom the data have been communicated, except in the case in which such fulfillment proves impossible or involves a use of means clearly disproportionate to the protected right. The user also has the right to data portability.